King Throgg is a most unusual Troll. His race is famed for their fierce ways and brutish strength and for a corresponding lack of intelligence but whilst Throgg may be a vicious brute, he is no idiot. In the bone-strewn wastes of Troll Country, at the heart of his icy labyrinth, he sits and thinks, brooding alone on his rocky throne, the filth-encrusted crown ringing one of his yellowed tusks a once-priceless heirloom taken from a great warrior whose noble quest led him only to Throgg's gullet. Once, Throgg was happy with a life of hunting and killing. He led his monstrous kin in successful raids, ambushes and night attacks, using the harsh climate of the north as an ally; to a Troll like Throgg, a brutal ice-shard blizzard is no more troubling than a light summer rain. 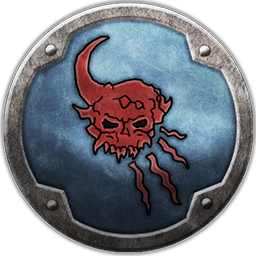 Throgg became known to the warriors of the Old World as Wintertooth, a fearsome and mindless adversary. Yet the mutations Throgg and his kin welcome can affect the mind too. One moonless night, as Throgg picked the flesh of his latest victim from his tusks, he stopped to consider the broken bodies of his prey. He began to think. As Throgg muttered to himself through the following days, his eyes burning with cold fire, a grim and malevolent cunning grew within him. If Man and the other races of the so-called civilised lands of the south were so keen to fight him and his bestial subjects, then fight them he would. He would gather a nightmarish horde of Chaos-infested creatures and overrun the lands of man in the name of the Dark Gods!